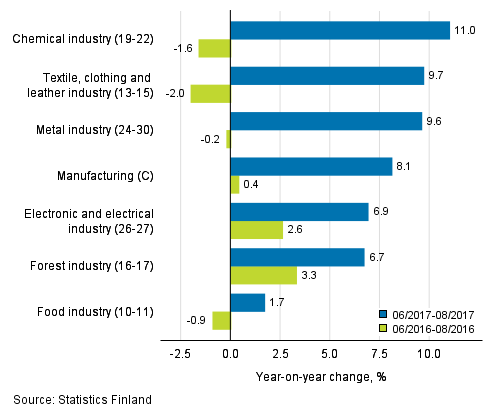 According to Statistics Finland, turnover in manufacturing in the June to August period was 8.1 per cent higher than in the corresponding period of the year before. Domestic sales grew by 6.2 per cent and export turnover by 9.6 per cent from one year ago. Turnover went up from the corresponding period of the previous year in all manufacturing (C) sub-industries . The growth was strongest in the chemical industry, 11.0 per cent, in the textile, clothing and leather industry, 9.7 per cent, and in the metal industry, 9.6 per cent. Turnover grew least in the food industry, by 1.7 per cent. 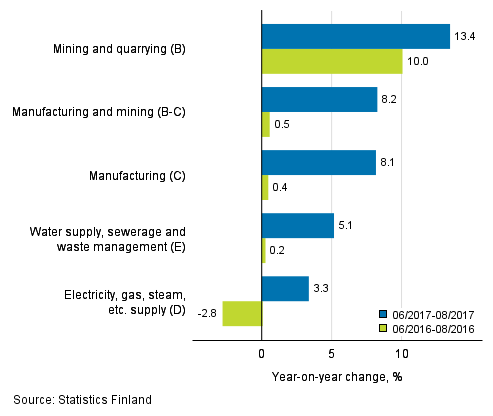 The turnover of all other main categories of manufacturing industries also increased year-on-year. Turnover grew strongest in the industry of mining and quarrying, by 13.4 per cent. Turnover in water supply, sewerage, waste management and remediation activities increased by 5.1 per cent, and in electricity, gas, steam and air conditioning supply by 3.3 per cent from one year before. ISSN=1798-596X. August 2017. Helsinki: Statistics Finland [referred: 22.4.2019].